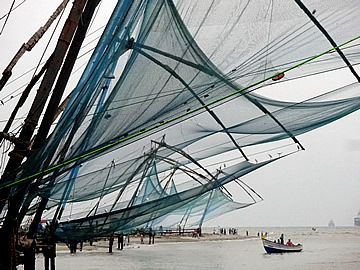 The famous Chinese fishing nets make a very picturesque sight, but there's much more to Kochi: centuries of history, fabulous murals, a fascinating communal laundry and great food. 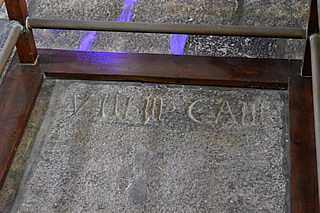 Original grave of Vasco de Gama. 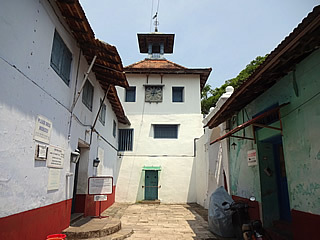 Vasco de Gama died in Kochi from malaria in 1524. Initially he was buried in the Church of St Francis but in 1538 his body was disinterred and taken to Portugal. 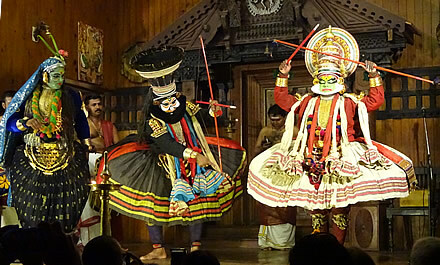 The state of Kerala, 550 km long stretching down the south/western Indian coast, is quite different to the rest of India. 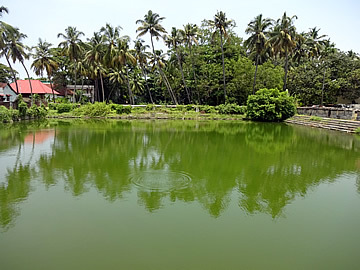 Green and often wet the landscape couldn't be more different to Rajasthan, and politically Kerala is also unusual, having strong Communist sympathies. 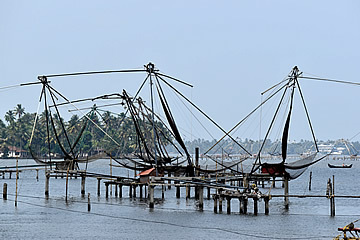 Kerala has been a hub of trading activity, particularly for the precious spices, for over two thousand years, having traded with the Romans from the port now known as Kodungallur, just north of Kochi. Ports on this length of coast were well-positioned for ships travelling the trade routes between Europe, Africa and Arabia in their long voyages to the Far East for restocking and further trade. 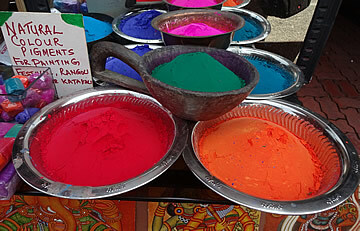 Thus the region has influences from all of these cultures. 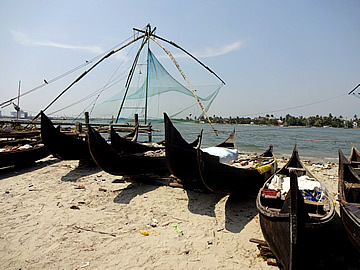 They are said to have been introduced to the fishermen of the Malabar coast by traders from the court of Kublai Khan. 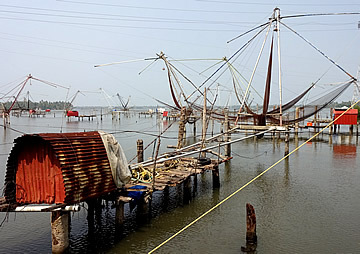 Kochi (Cochin) became an established trading centre at the turn of the 15th century after the Portuguese maritime explorer Vasco de Gama first arrived with a small fleet of ships in Kozhikode (Calicut) in 1498. The Portuguese had to fight both the French and Dutch to maintain their influence over trade and in the early 17th century the British arrived in the form of the British East India Company, given the right to trade by the Zamorins, local rulers who historically favoured the Arab trading nations. 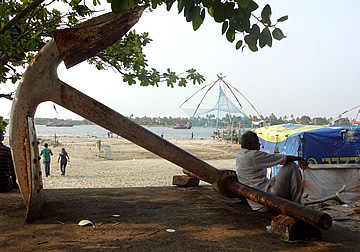 One of the four ship's anchors from the dredger Lord Willingdon which arrived in Cochin in 1938, a vital workhorse in Sir Robert Bristow's plan to create a world-class port. 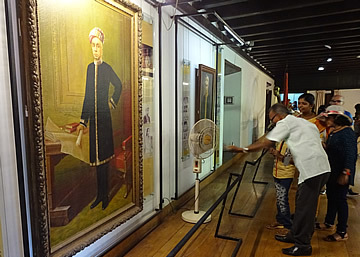 At the end of the 18th century the British led the drive to rid the region of Tipu Sultan, the ruler of the Kingdom of Mysore, whose father, Haidar Ali, had waged bloody war to conquer most of what is now Kerala. 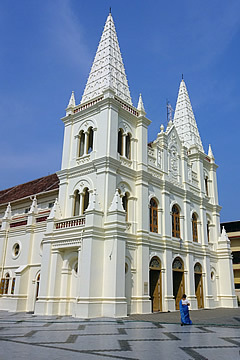 In return, all the surrendered territory, including Kochi, was placed under direct British rule. It was the British who were responsible for developing the port in the early twentieth century so that it could accommodate modern shipping. Our hotel, car and driver Das in Fort Kochi. Our driver, Das, had met us at the airport with a very comfortable air-conditioned car and cold water, and he was to be with us for most of the rest of the trip. 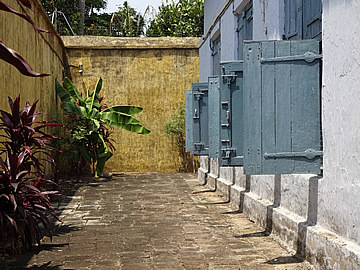 We were staying in the older part of Kochi in Fort Kochi (Fort Cochin) where the Portuguese built the first fort - the modern part is Ernakulam in the east. It's about 40 km from the airport mostly through commercial area with lots of small businesses and very busy. 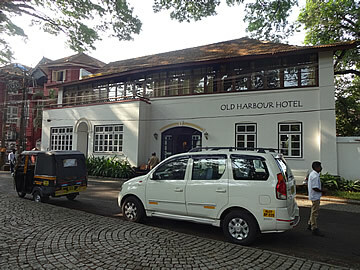 The Old Harbour Hotel was the first hotel in old Cochin, built by the Dutch over 300 years ago. For a while it was the home of British tea planters before falling into disuse. 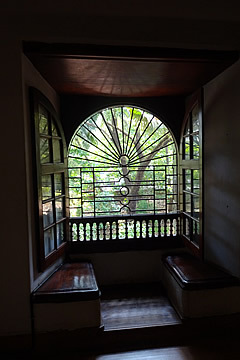 Now it is thoroughly renovated and very comfortable with very friendly helpful staff - in fact everywhere we went in Kerala the people were incredibly nice. Our room in the Old Harbour Hotel. We were a mite early for our room but were efficiently checked in then settled with tender coconuts, the first we'd had and very refreshing. 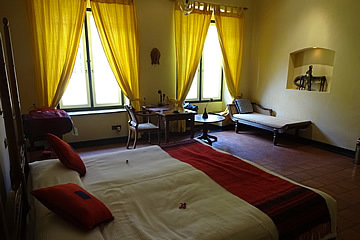 Our room was beautiful - pale yellow walls, high ceilings, very efficient air conditioner as well as a ceiling fan; it was always very cool. 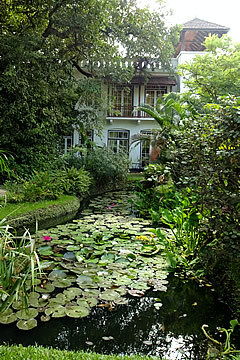 Lily pond in the garden. Large rocks used as counterweights. 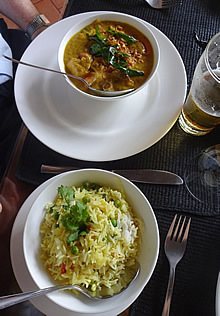 Chicken curry at the Old Harbour Inn. 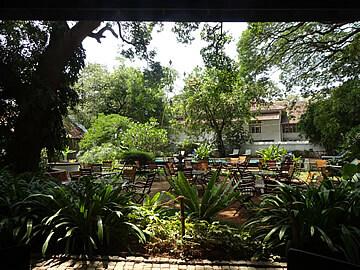 The restaurant opens up onto the hotel's lovely shady gardens. One evening when we were dining there was a huge thunderstorm and a brief power cut - in moments all the staff had their phones out to light up the room! 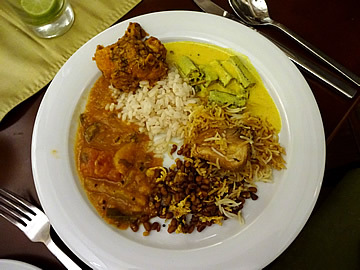 We had some good food at the hotel, including the chef's special, a pork vindaloo. 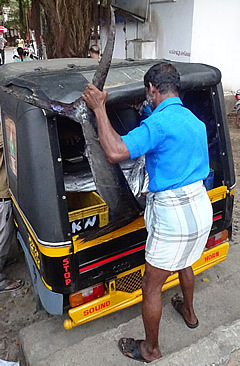 Throughout our travelling in Kerala we found, however, that food tended to be made very mild, when we actually like it quite spicy. It was difficult to convey this to the people, who must be continually asked to make it not too hot. On our first morning in the city, quite early to try to avoid the hottest part of the day, we met up with our driver and a guide, George V.V. 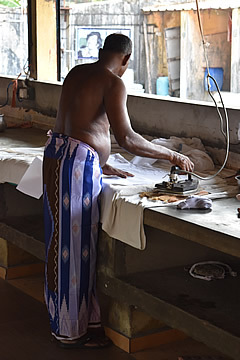 according to his card, though we called him Mr. George .He gave us a superb tour of Kochi starting, naturally, at the Chinese fishing nets which were a very short walk from the hotel - in fact we'd strolled over there the previous afternoon. 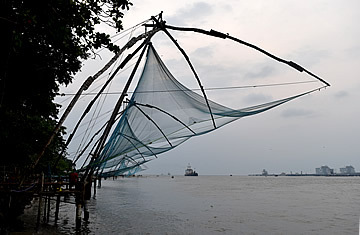 The Chinese fishing nets are said to have been brought to Kochi by traders from the court of Kublai Khan. 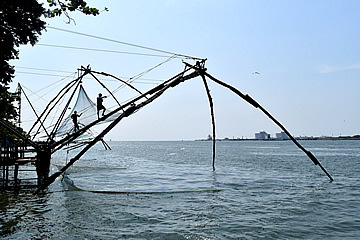 The men move out onto the framework, shifting the balance of the net so that it dips into the water. Move off the frame and the net lifts. Work over for the day. They take a minimum of four men to operate but are very simple. 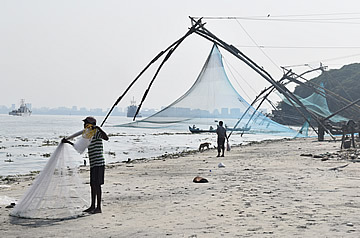 The nets are counterweighted with stones at the back, the movement of the men onto and off the framework lowers and raises the net from the sea. 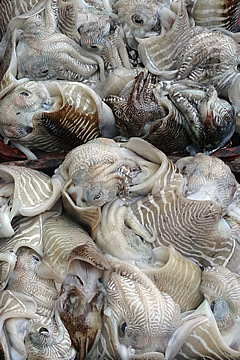 The nets are only left below the surface for a few minutes before being raised. 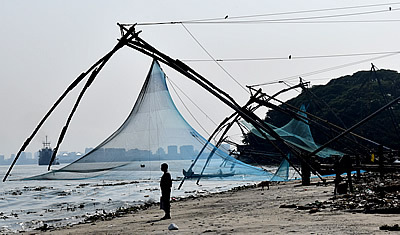 Any unfortunate fish that happen to be above the net at the time are hauled out and scooped up to be sold from the beach. The system works, it's also extremely photogenic. 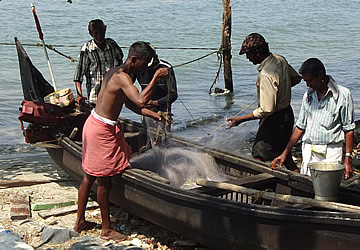 Fishermen with a traditional fishing canoe. 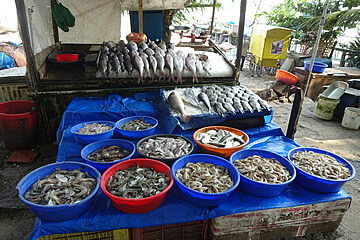 Most of the fish we saw in the nets were quite small. In truth there are all kinds of fisherman here. 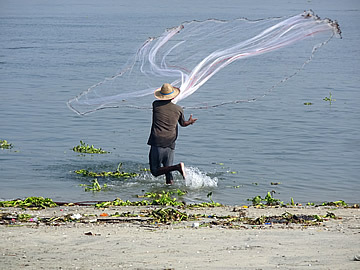 Those who fish from boats, of all sizes, those who use the Chinese nets, and those who work on their own from the beach, casting a circular net into the sea. 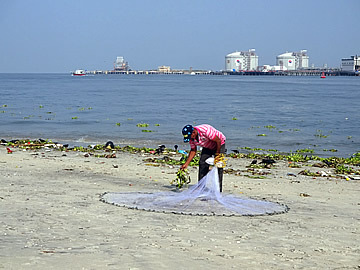 The net is weighted along its rim and meticulously cleaned and laid out before being cast into the sea. 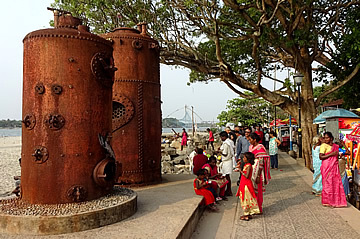 Two old ship's boilers on the waterfront. Punkahs in the Church of St Francis. 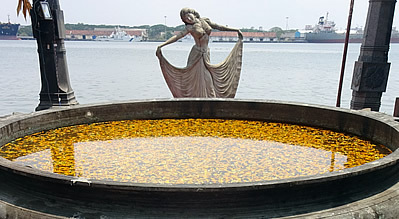 I could have watched the fisherman for hours, but we had a city to explore. Next stop was the Church of St Francis, the oldest European church in India having been built by Portuguese Franciscan friars in 1500. Vasco de Gama was buried here when he died of malaria but his body was later disinterred and removed to Portugal. 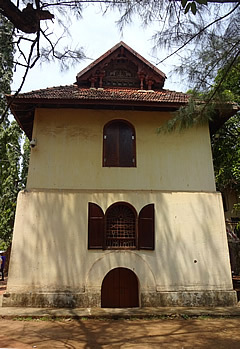 The Dutch converted it to a Protestant church in 1663 which it remained until 1804 when it was voluntarily surrendered to the Anglican community. 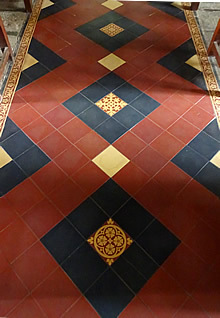 Beautiful tiled floor in the Church of St Francis. 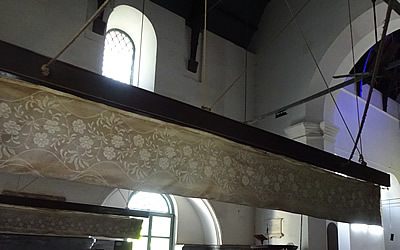 What I liked most about this church was the punkahs - long strips of cloth suspended above the congregation on both sides of the central aisle. They were a primitive air conditioner, wafted back and forth by means of a rope system which the punkah wallahs operated from outside. quick tug will release it. 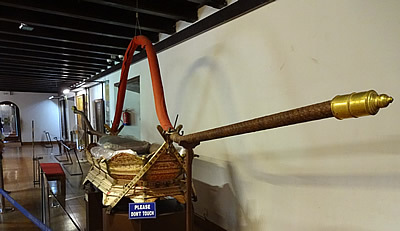 There's an ironing room as well, a low, open-sided structure with mostly men doing the ironing, using a starch solution and electric irons weighing 8kg! The shirts looked absolutely beautiful but quite stiff. 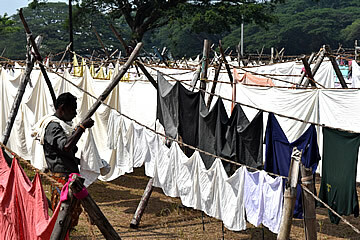 A 74 year-old woman still working in the laundry. 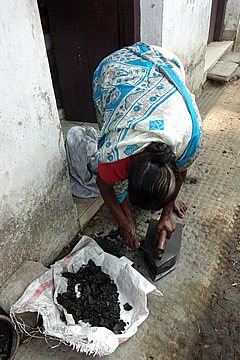 A 74 year-old woman was still working there, using an iron filled with charcoal, also weighing 8kg. She earns the same as the young men. 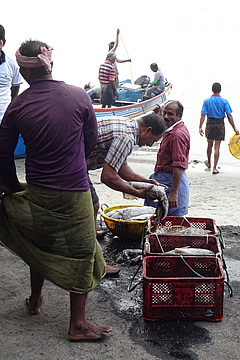 Though the work is hard it is well-paid, the fishermen earn far less. 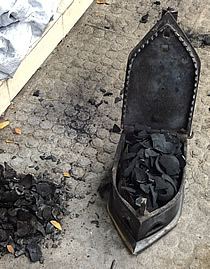 The charcoal is heated until it glows before the iron is used. 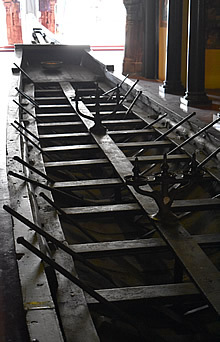 The tank at Mattancherry Palace. 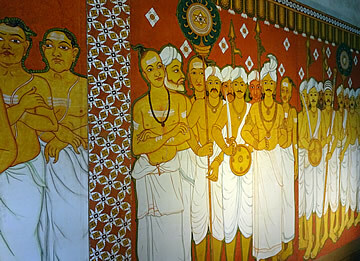 On to the Mattancherry Palace, a place I particularly wanted to see for the famous murals. 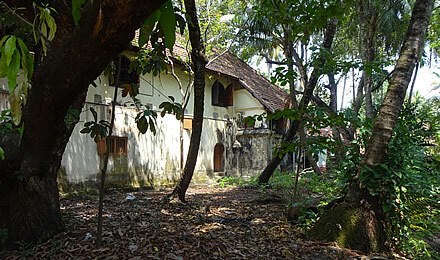 The palace was built for the Raja Veera Kerala Varma of Kochi around 1555 by the Portuguese as part of their negotiations to be granted trading rights. In the following decade the Dutch essentially rebuilt it as a two storeyed quadrangular building set around a courtyard with temples. 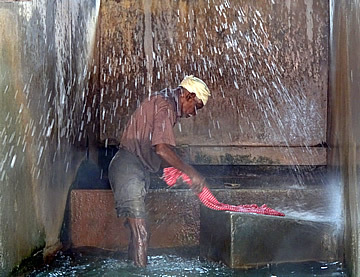 The palace also has a large tank, traditionally used by the people to perform ablutions before visiting the temple. 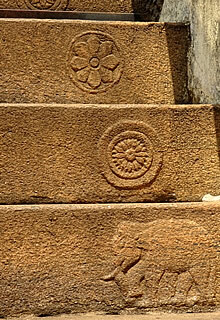 Decoration on the steps leading up to the second storey where the murals and museum are located. Inside the palace it is all fabulous carved teak ceilings and doors and the wildly colourful murals - unfortunately no photography of the murals is allowed. 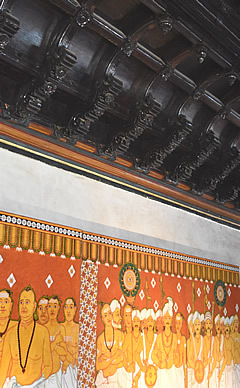 Mural in the entrance hall (not one of the famous murals and photography was allowed), labelled "Noblemen of the country joins with King and retinue". 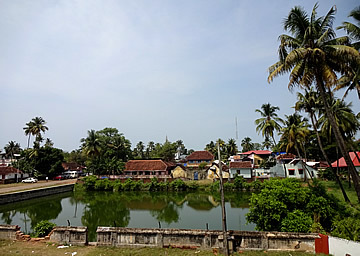 View over the tank from the palace. Mr George points out to a child that the feet of the man in this portrait always seem to point to the viewer, no matter where they stand. It was quite amazing! 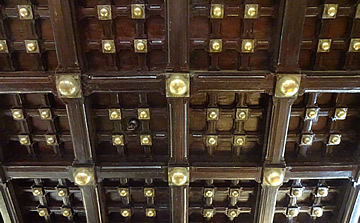 A royal palanquin in the portrait gallery. 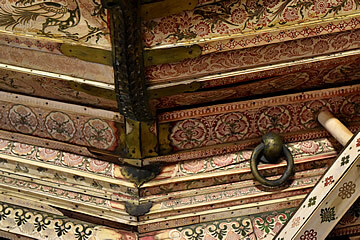 Detail of the decoration on the royal palanquin. 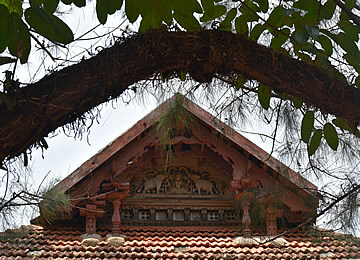 The east end of one of the wings of the palace - detail on the gable below. 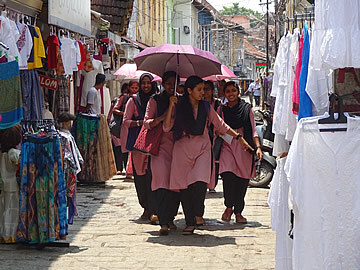 The Mattancherry district of Kochi was once the centre of the spice and tea trade. We left the palace on its east side and walked to the Jewish synagogue through the heart of what is known as Jew Town. We saw very little evidence of spice trading, only shops selling a range of spices, though there are still spice auction houses here apparently. Rather there are a lot of tourist-oriented shops and cafés. The synagogue is light and airy, hung with glass chandeliers and with a fabulous floor of beautiful hand-painted blue and white Chinese tiles, no two quite the same. There has been a Jewish community here for many centuries but the synagogue is little used now, as so few remain. 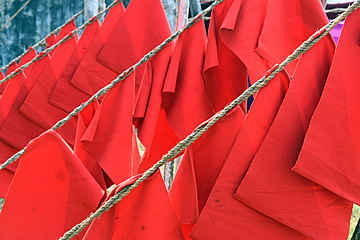 A minimum of ten is required for a service and sometimes some come from surrounding areas. Again, no photography was allowed inside. 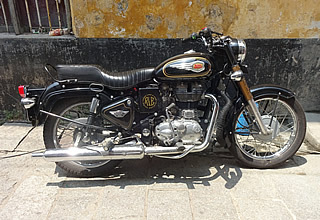 We saw many Royal Enfields in Kerala. Originally a British company, it is now Indian-owned and the motorcycles are now only made in India. 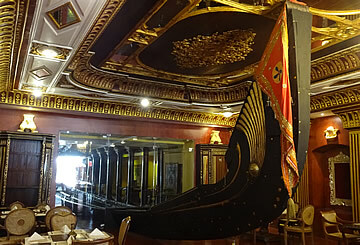 Our final stop was Ginger House museum restaurant and hotel which has a 33m long, 120 year-old snake boat stretching from the entrance practically out to the other side of the restaurant, where there is a veranda overlooking the waterways. The snake boat was powered by oarsmen sitting two to a row. 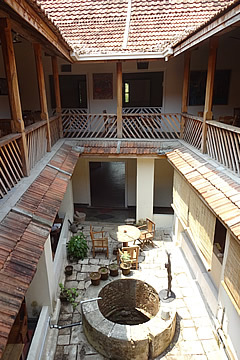 Snake boat at the Ginger House, so-called because it is said to resemble a hooded snake. We were hungry but had already chosen the place we wanted to have lunch: Farmer's Café. We were seated on the upper veranda and had refreshing lime and ginger sodas with mint leaves crushed into them while we chose our food. I settled for a prawn masala and Andrew had a fish masala which turned out to be much spicier than mine - we'd anticipated them being similar. We had superb pineapple lassis with the meal - these became a firm favourite throughout our trip. 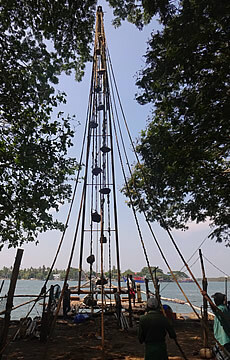 The best food we had in Kochi was at the Taj Malabar on the northern tip of Willingdon Island. We were the guests of Thomas, executive director of Kalypso Adventures that had organised all our internal travel, trips, accommodation etc., and his wife. Thomas recommended that we have the buffet as it gave us the opportunity to sample many different dishes, and we didn't hold back, having small portions of all kinds of spicy curries - there were ten on offer as well as all the side dishes. 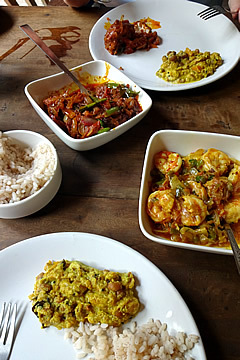 Among other things I had Vendakkai moru curry - okra cooked in butter milk and spices, Karamani seeds thoran - kidney beans cooked with grated coconut and tempered, Sambar - mixed vegetable cooked with lentil and spices (we had a lot of this on our travels! ), Murgh dum biryani - chicken and basmati rice cooked with aromatic Indian spices, and Methi murgh - chicken and fenugreek cooked with Indian spices. 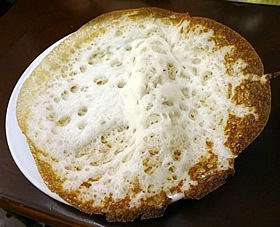 Chapattis and gorgeous paratha plus a lacy rice pancake, new to me, called appam which is made from a rice mixture flavoured with cardamom, clove and cinnamon and eaten with a white broth. The chef gave us a demonstration of how it was made - quite an intricate process using, I think, a yeast and ground rice solution which had been left to ferment for a while. The desserts were also fabulous. 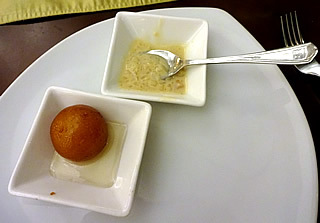 I had Gulab Jaman - a deep fried dough ball in syrup, Balada - a cardamom rice dish which I thought I wouldn't like as I detest pudding rice at home but this was absolutely superb, and home made coconut, ginger and cardamom ice creams, the three signature flavours of Kerala - all excellent, the cardamom left a wonderful taste in the mouth. We finished with tea and little grains of aniseed which are supposed to be good for the digestion. 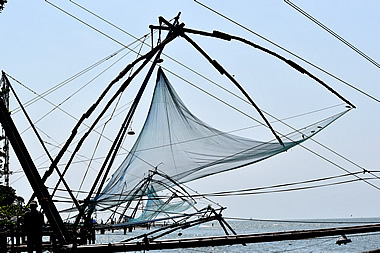 The main reason for coming to Kerala, for us, was the food which has a great reputation - we had certainly started off well! 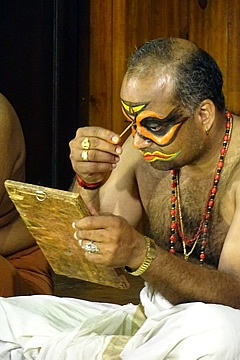 The four actors and a helper apply the elaborate make-up. 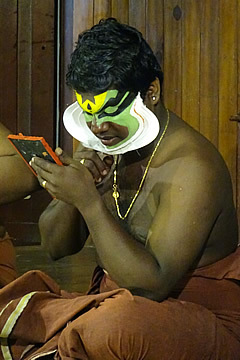 The skilled helper created facial pieces with white paper which he cut out ad applied with a glue of rice paste. 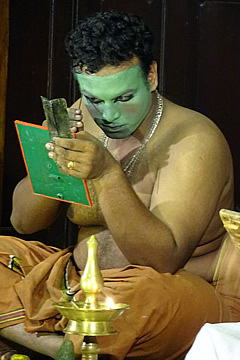 This make-up signifies a noble character, here Prince Arjuna. 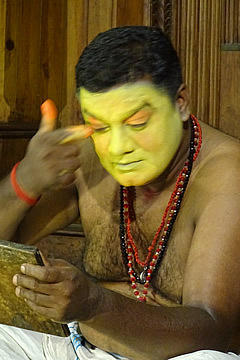 Make-up for the undisguised Lord Shiva. 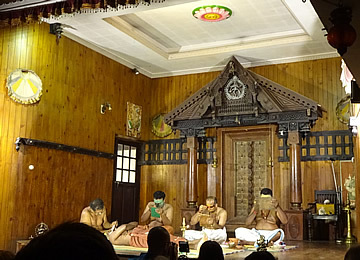 The energetic performance involves a continuous background music and is not without humour. Before it began we were given a demonstration of the facial contortions required of the actors to display emotional states, a vital part of the performance. These involved rolling eyes, raising and lowering eyebrows, shuddering cheeks and quivering lips. As well as facial contortions there are a number of body movements, for instance flicking hands and arms indicating commands such as "go away". The makeup of Lord Shiva as a hunter. 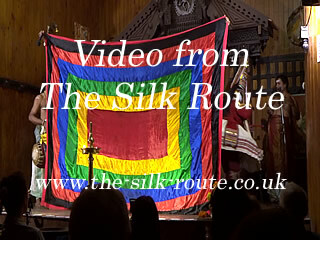 Video: Kathakali - the beginning of the story. 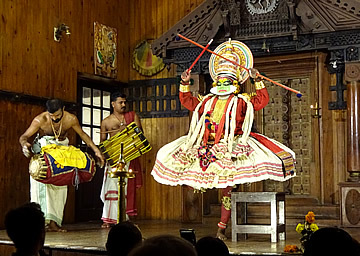 Kathakali - meaning "story play" - is a traditional south west Indian dance-drama with fantastical costumes and vividly coloured make-up. 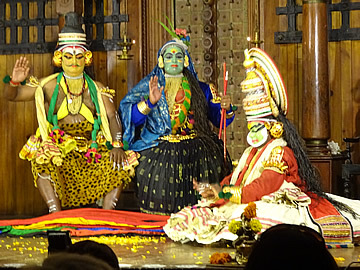 Traditionally these performances are very long, overnight or even over several nights. Thankfully we were treated to a shorter version, an excerpt from the Mahabharata called "Kiratham" which tells of Prince Arjuna's quest for the powerful arrow Pasupatham. Arjuna, third of the Pandava Princes, is a famous archer and very proud of his skill. He prays to Lord Shiva to become for perfection in archery. 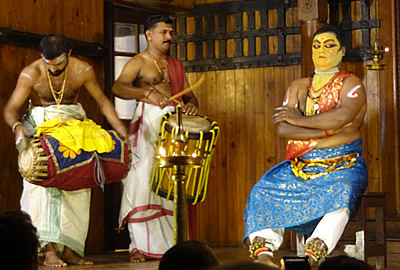 Shiva believes Arjuna is too arrogant and, encouraged by his wife Parvathi, plans to humble him. Lord Shiva and his wife Parvathi. Meanwhile Arjuna's sworn enemy and rival, King Duryodhana of the Kauravas, is intent on murder. 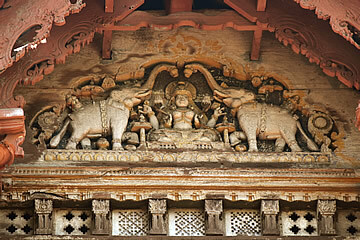 He sends the demon Mookasura, disguised as a wild boar, to kill Arjuna. However, when the boar attacks, Lord Shiva, disguised as a hunter, shoots an arrow and kills it. 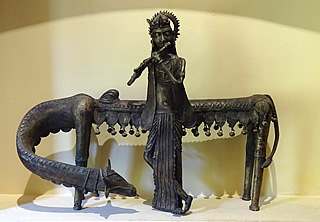 Arjuna has also loosed an arrow into the boar, which angers Shiva. There is a violent clash between the two in which Lord Shiva emerges victorious and Arjuna loses his egotism. 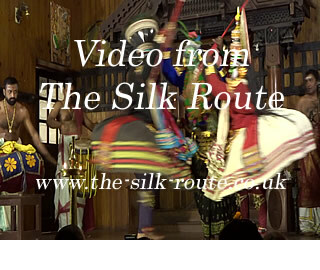 Video: Kathakali - the duel. 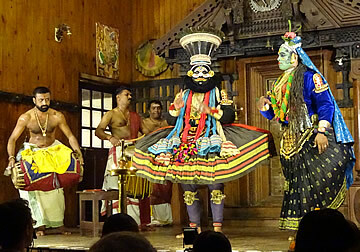 Finally, Lord Shiva sheds his disguise, blesses Arjuna and gives him Pasupatham. 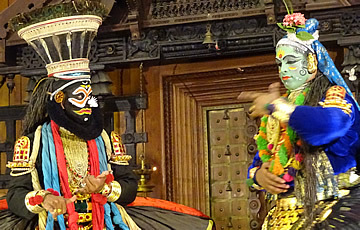 Lord Shiva, now undisguised, blesses Prince Arjuna. There was a "narrator" with cymbals, and energetic drummers who didn't seem to pause for the whole performance. Shiva did "speak" in a very strange high-pitched cooing tone, almost birdlike. It was very interesting to see, so very different from what we are used to in terms of entertainment. Definitely recommended for the make-up, costumes and sheer exuberance of the performance, but I personally prefer the beautiful dances we saw in Rajasthan particularly at Bikaner. 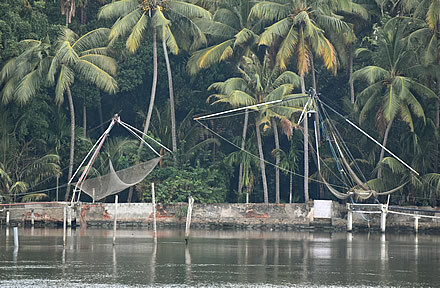 Kumbalangi is a village on an island south of Kochi where the main occupation is fishing. 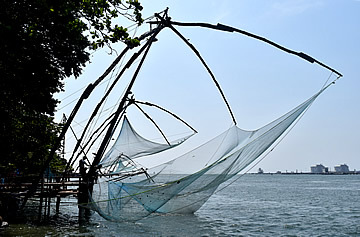 We came here to see the many Chinese fishing nets deployed along its coast. There are hundreds of them around the island, we went to a spot in the north west where it was easy to get close to some of them. 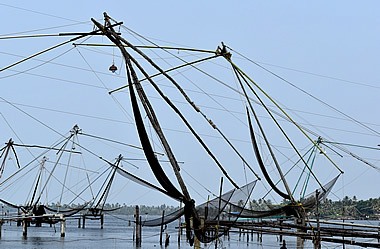 Many nets had a small hut at the end of the v-shaped frame. As it was Good Friday there was no fish being caught - it would be more interesting, I think, on a working day.